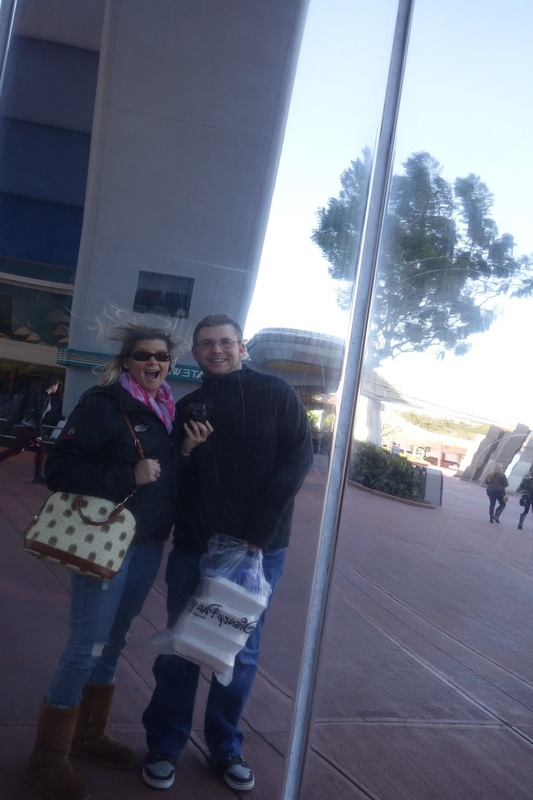 We celebrated this Epcotiversary a bit early this month since I had a Junior League meeting on the night of the 16th. It worked out perfectly, however, since my brother and his family were in Epcot that day. My Disneyfied niece, Amelia, brought three of her friends with her. Amelia and another girl were Disneybounding as Belle and Snow White. Our first stop was Test Track; this pregnant mama sat it out, along with my hubby and sister-in-law. Then we headed to France where the non-pregnant adults got mimosas, and we all had breakfast pastries. 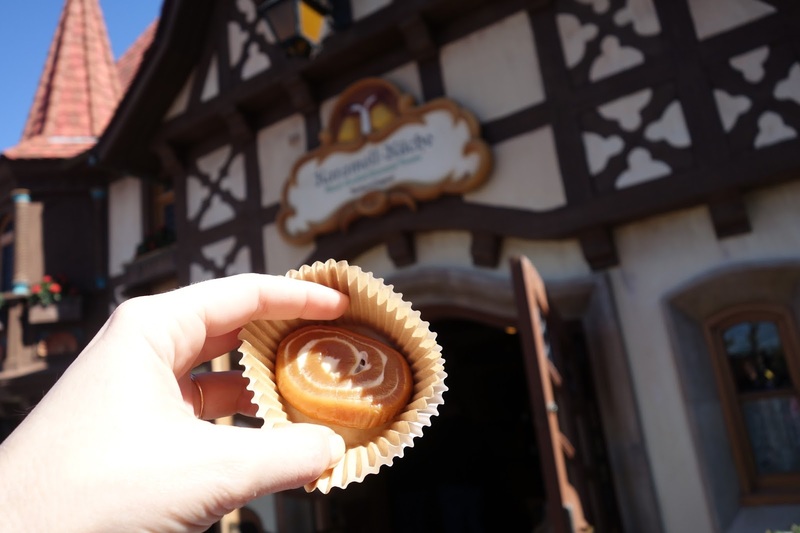 Epcot's bakery is the only place in World Showcase that opens before 11:00 am (with the exception of Akershus in Norway). As we left France, Belle was out meeting guests with no line. 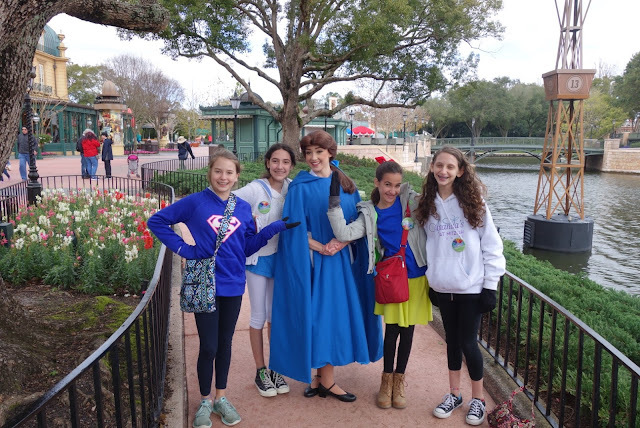 Amelia had to stop and get a picture with her Disneybound doppleganger. Since we picked Italy out of the Epcot mug for this month, lunch was at Via Napoli. It's nice that they let you order a half and half pizza there- I always go with classic pepperoni because it's just SO GOOD; John chose a white pie. We also had salad, and shared a pasta dish. There was enough food for us to have leftovers for dinner- what's better than Via Napoli for lunch? Via Napoli for lunch AND dinner, that's what. We continued our stroll around the World and stopped in Germany at Karamell-Kuche. My favorite treat there is the caramel and marshmallow swirl- it's just enough of a sweet treat. After getting our caramel goodies, we continued on. The weather was pretty darn cool, but the sun was bright and the sky was this beautiful blue that only happens during a Florida 'winter.' Honestly, February is my favorite month here. The temperatures are lovely and most days are clear and sunny. The parks aren't too crazy. 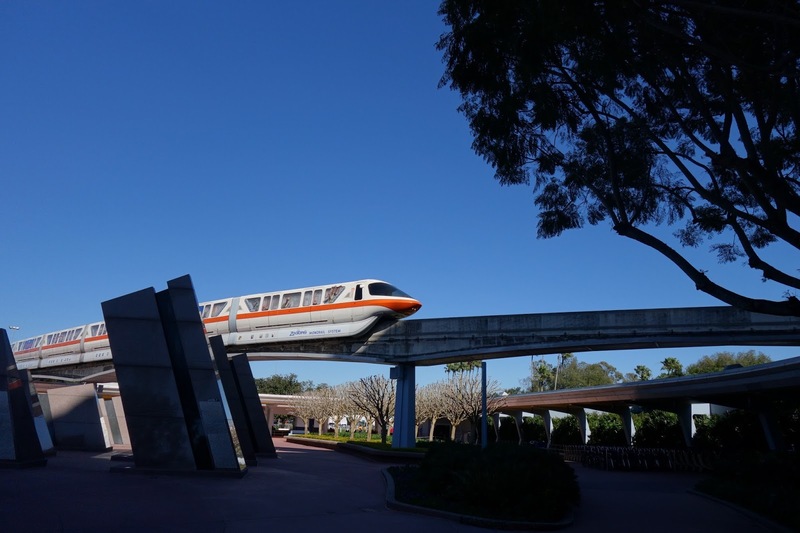 In my opinion, it's the perfect time to visit Walt Disney World. 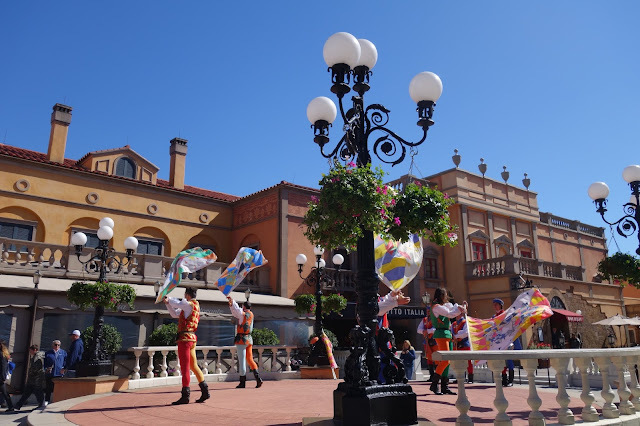 John and I parted from the rest of the crew in Mexico, where they went off to ride Grand Fiesta Tour. He and I had lots of errands to do, since it was the last weekend before we were set to move. On our way out, we snapped a (WINDY!) Spaceship Earth Selfie. It was another wonderful Epcotiversary- can't believe there's only two left, and then we celebrate our ONE YEAR!! I LOVE your Club 33 Dooney! I feel like it almost has a Tower of Terror deco vibe? 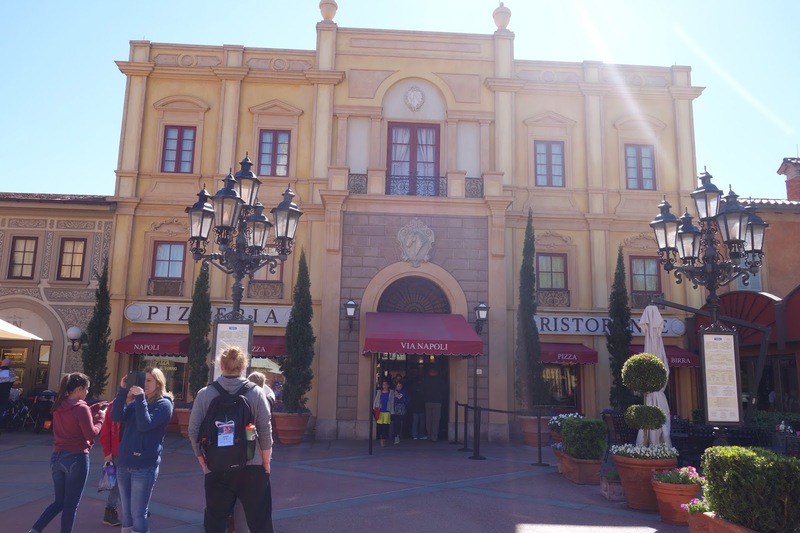 Via Napoli looks amazing - we're in such a food rut when we go to EPCOT. We'll have to branch out the next time! You know, I never would have thought of the TOT vibe, but now that you say it, I TOTALLY see it! And I love it! Good call. 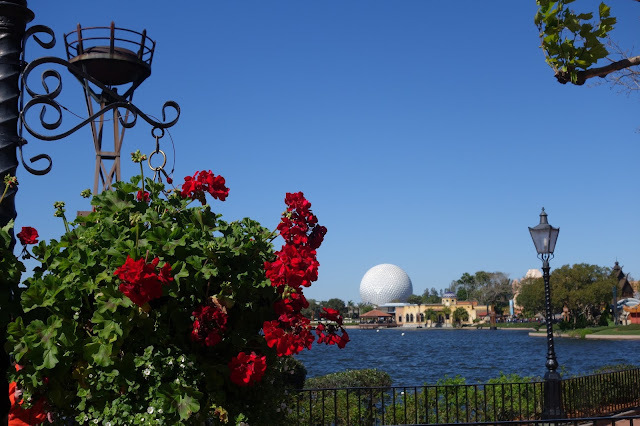 What are your usual haunts when you visit Epcot? 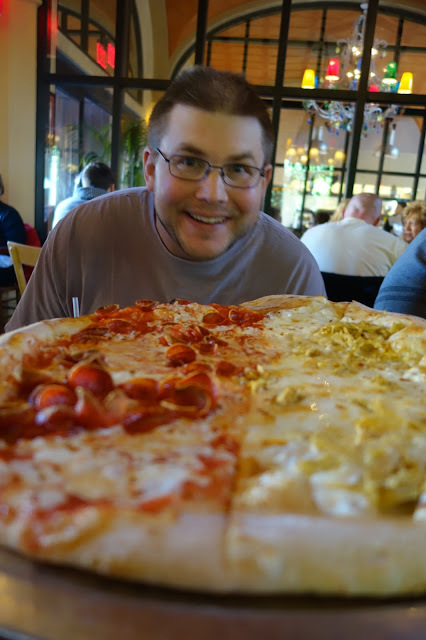 Via Napoli is one of our favorites- you should definitely try it next time! Thanks for reading. Via Napoli is SO yummy- a must-do for sure. Keep those SSE Selfies coming! Thanks for reading Kari. That trip was so fun. I miss Disney and my ant Ashley. Oh yeah and JHON too. Hugs and kisses from me. XOXO right back at ya!